It was for a grand bascinet, the project was made using a wooden last of the helmet which he then stretched and stitched leather over to get the shape, then he covered that in fine leather and carved figures and florals and a coat of arms (or it was the cross of st george) into it. He lined it with velvet and added a buckle. I think it was Josh Davis of Davis Reproductions. Check his Facebook page; I think that's where the pics are. On second thought, I don't think it was Josh. I think Ugo Serrano collaborated with someone else. if its the one Ugo was involved in, it was "Armatus Corpus", an exhibition at the Chateau de Morges which ran from July till December 2016, and involved an assortment of armour by Per-Lillelund-Jensen, Roman Tereschenko, and the velvet covered armet, which was a collaboration by Jeff Wasson, and Ugo Serrano. 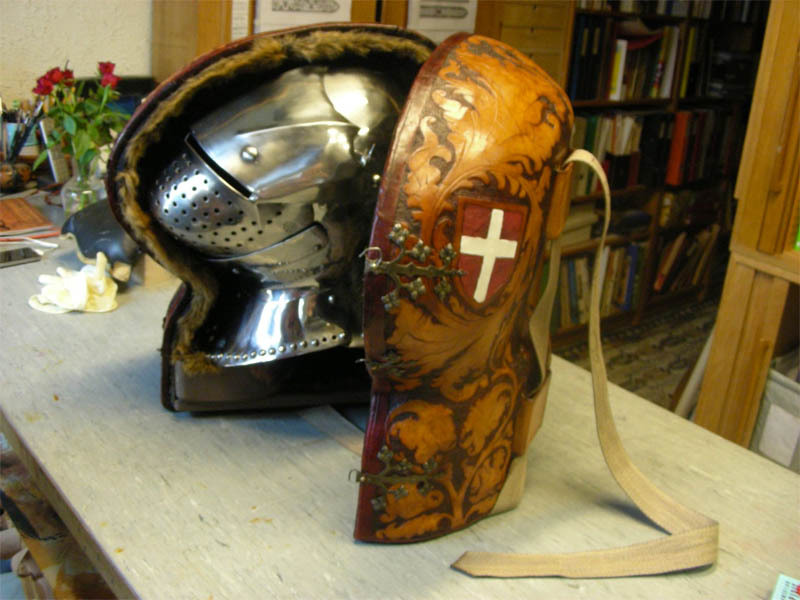 The bascinet however, was the wok of Per Lillelund-jensen, while the leather case was by Marquita Volken of "Gentle Craft - Shoe Museum" (search for that on facebook, you should get their page. ), with ironwork on the case made by Ugo. I've attached a photo from gentle craft to confirm that's the one you were thinking of. That is exactly the one I was looking for, thank you.